Forbidden Healing is a 0 Mana Cost Epic Paladin Spell card from the Whispers of the Old Gods set! Spend all your Mana. Restore twice that much Health. Rating: 3.5/5. From 1521 votes. I can’t wait to steal this into my priest hand and reverse it…..
helps vs freez mage but other than that I don’t think pally has trouble dealing with agro. Might be good in a murlock pally but I don’t think so in a secret pally. Priest definitely got the better deal here with forbidden shapeshifter. Just in general 1 mana > 2 hp. Something that is isn’t obvious, but its ability to target minions makes this even better. 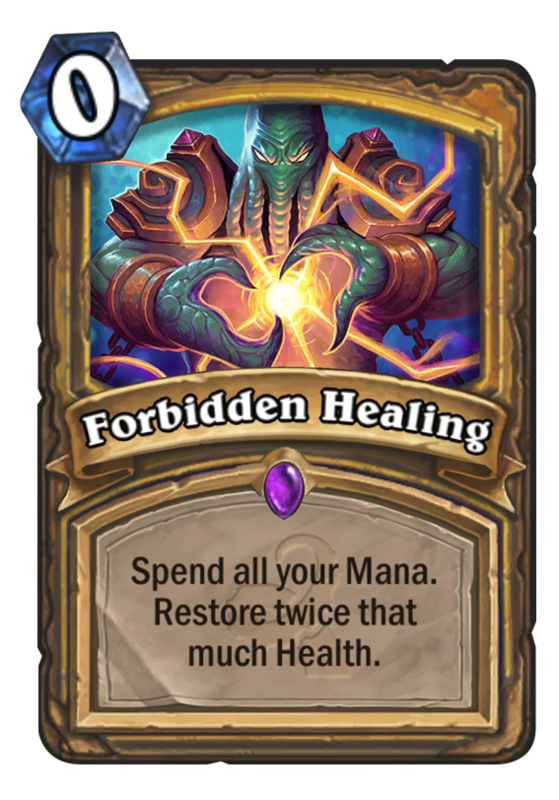 There’ll probably be plenty of turns when you have a couple mana left over and being able to heal a minion for 2 or 4 or even 6 can be particularly problematic. Obviously at high mana, it heals for quite a bit and gives a strong tool to Healadin Control, but its ability to heal minions (assuming they keep their wording standards) makes this a potentially very powerful card. We don’t know what the other cards are, but this could be one of the better ones as it can help you out-value slower decks, out-heal aggro, or keep yourself out of various combo ranges. And of course, people will frustrate people to no end with endless healing Fatigue-adins, which could be a thing. Highlander Elise Paladin will be strong. 148 health ladies and gentlemen. Paladin can heal up near to 5 times of his initial hp. Wouldn’t that be a tad too powerful for turn (5)-10 play? Especially for aggro hunters to finish. Maybe something more like a Hunter – Forbidden Kill Shot: Spend all your Mana. Deal damage that Mana amount to a character. The soulbound cards had “Restore …” and “Restore … to your hero” effects. The soulbound “Restore …” cards work like “Heal …”. They are targeted effects. Cards released from classic onwards with “Restore …” work like “Restore … to your hero” and are non target effects and all cards with targeted healing effects have now wordings with “Heal …” instead. This card only heals your hero and would be an epic fail in combo with Auchenai. This isn’t true. Flash Heal simply says “Restore 5 Health.” but is obviously quite targetable. Antique Healbot reads “Restore 8 health to your hero.” The only “heal” card that doesn’t use the word “Restore” is Reno Jackson, but that is the exception not the rule. It’s the “To Your Hero” which is in the other cards that restore health only to your hero which is the key. You can use Healing Wave to heal a minion, though almost never does someone when they run it. It is safe to assume this card is fully targetable. ^ Yup exactly what he said. You can look at it at the link below for yourself. All heal cards that only heal your hero states it explicitly. Forbidden Mana you get double mana crystals for what you have????????? Great Card, maybe murloc Paladin is not dead after all. 2nd Anyfin is still 30-32 damage. humm, typically it’s not a good idea to use all your mana without putting something pretty good on the board. Doesn’t it automatically target your own hero? I think this card is an amazing adittion for midrange palladin deck. Is pretty versatil. I am not sure of what palladin will be in standard. Palladin Washington weak before GvG. No minibot, no zombi, no quartermaster, no belcher… But if a control deck is viable, i think one copy of this card will be in, ¡there isn’t also sanabot! And in wild, I would try to cut sanabot and try this. Or just play it in average control paladin, line murloc paladin. you may not be able to choose target with this card…. I think you can. Nowhere in the card does it say “to your hero”. All the “restore” cards that only heals your hero specifies it explicitly. You can see in the list of card in this link.